Bolt Pattern Pro - Quickly & Easily Measure Bolt Patterns on Both Wheels & Hubs! "Best New Product of the Year Award"
Have you ever wanted a tool that can easily help you measure a vehicle's bolt pattern? Have you seen the designs that are available?? Some bolt pattern gauges are one complicated piece while others are 15 difficult to sort pieces. To make them even worse, most tools will not work on both hubs and wheels. You probably have used a tape measure to try and measure bolt patterns. But that can be tricky. Hubs get in the way. You can't measure 5-lug wheels with precision. Half the wheels out there are metric. The Bolt Pattern Pro easily solves all those problems. First, it's designed to go around the hub. No more bending your tape measure. No more trying to eyeball and guess the exact measurement. It's manufactured from a clear, durable plastic - making it the easiest to use bolt pattern gauge on the market! Second, the Bolt Pattern Pro is designed for precision. 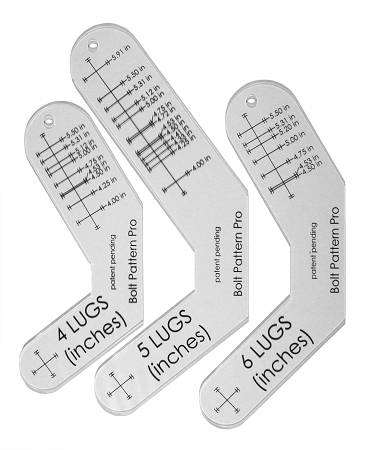 For each lug configuration (4-lug, 5-lug & 6-lug) the Bolt Pattern Pro contains one tool for both Inch & Metric measurements. A laminated Inch to Metric Conversion Chart is provided as measurements on the tool are provided in Inches. This tool will line up exactly with your lugs, nuts or wheel holes, giving you an exact bolt pattern measurement. No more guessing. No more multiplication for 5-lug configurations. 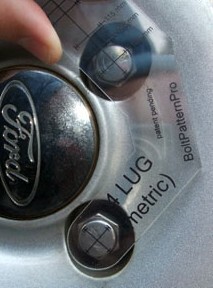 Imagine how quickly you can find the bolt pattern of your or your friend's car when all you have to do is look at the number of lugs on the wheel, pull out the associated Bolt Pattern Pro and the Conversion Chart, align the cross-hairs with the center of the lugs and read the measurement. That's it. Instead of pulling out a tape measure and bending it around a hub or trying to guess if it's 4-5/16" or 4-1/2" you can use the Bolt Pattern Pro and know for sure. Can Help You Save Time & Money! 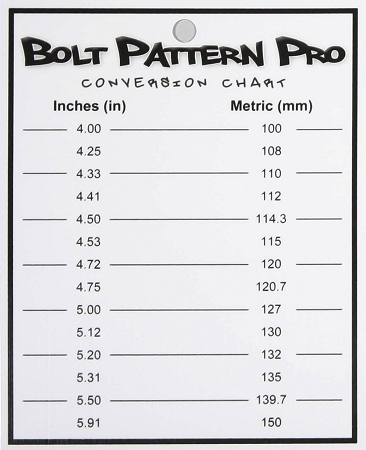 The Bolt Pattern Pro will measure the 29 most common bolt patterns for 4, 5, & 6 Lug vehicles. As mentioned above, the tools provide all measurements in inches so when a metric measurement is required, simply refer to the included CONVERSION CHART. Inch: 4.00", 4.25", 4.50", 4.53", 4.75", 5.00", 5.12", 5.31", 5.50"
Inch: 4.00", 4.25", 4.33", 4.41", 4.50", 4.53", 4.72", 4.75", 5.00", 5.12", 5.31", 5.50", 5.91"
Inch: 4.50", 4.53", 4.75", 5.00", 5.20", 5.31", 5.50"
If for any reason you're not satisfied with the Bolt Pattern Pro, simply send it back within 30 days and we'll refund your money, no questions asked. The Bolt Pattern Pro is made from a clear durable plastic and guaranteed not to break. If the Bolt Pattern Pro breaks within one year of your purchase, simply send it back and we will replace it - no questions asked. We are certain you'll be 100% satisfied with the Bolt Pattern Pro. Automotive Enthusiasts & Professionals Rejoice! No longer do you have to settle for old-fashioned and clumsy wheel lug gauges. 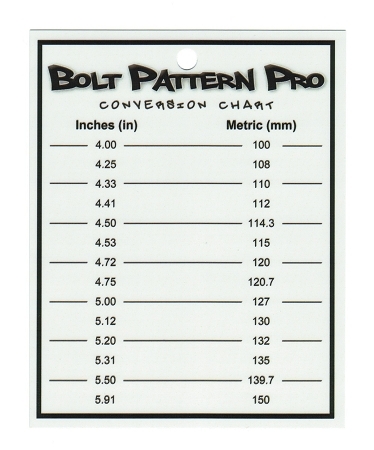 Forget the slide rulers, the circle tools, the ring tools and step up to the Bolt Pattern Pro today! Quickly and easily identify 4, 5, & 6 Lug Bolt Patterns on both Wheels & Hubs! What do you have to lose? With our worry-free 30-Day Money Back Guarantee & One Year Warranty, you can rest assured you are getting an affordable, quality, USA made tool. Bolt pattern pro, used it to buy spare tire because of so many bolt patterns, worked great, worth the money. Bought this tool for a customer and he was impressed. They had a choice of a plastic slide tool or the BPP, I myself will stock the tool. Innovative and pretty handy for your average do it yourselfer or Craigslist junkie. I had a couple sets of tires laying around and had no clue what they were off of or what size they were. This tool made it easy-nicely constructed in handy bag with measurements printed right on it. 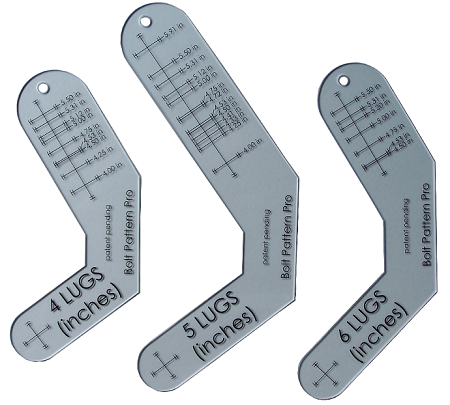 The bolt pattern gage is effective however not exact in it`s readings. You have to interpret the reading somewhat.